Alvarez ran his record to 24-0 (12 KOs) and sprinted around the ring as Kovalev stumbled back to his corner. Alvarez got the KO at 2:45 in the seventh as the sellout crowd of 5,642 at Etess Arena went wild for boxing’s newest champion. “I knew it was my chance and I wanted to take it right now,” Alvarez said. 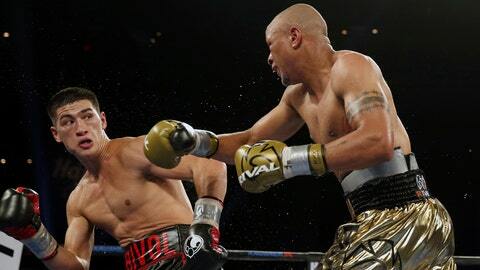 Alvarez won the WBO light heavyweight title and ended Kovalev’s latest reign atop the division. Alvarez, who once had surgery on his right hand, found the power in that hand to level Kovalev with a right and send him to the canvas. Alvarez, a Colombian, pounced and pounded away at Kovalev when he beat the 10 count and knocked him down two more times before referee David Fields ended the fight. Alvarez caught Kovalev, who hasn’t been the same since consecutive defeats to Andre Ward, and put those plans on ice. His third knockdown left Kovalev on all fours, and he sat motionless on the canvas as Alvarez took a victory leap into his corner. Kovalev was taken to a hospital. Who knows who he’ll get next? It was a thrilling ending to boxing’s return to the boardwalk for the first time in four years. Kovalev also headlined that Nov. 8, 2014 card and beat Bernard Hopkins in a championship bout on the last major night of boxing in Atlantic City. “I lost my mind when I started to get famous,” Ward said this week.